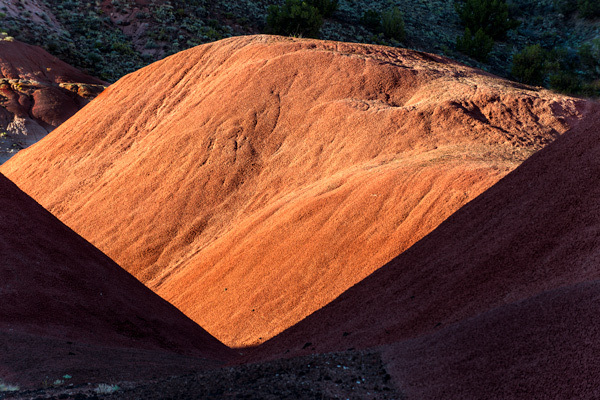 The sunset photo tour on Tuesday was great – great light and opportunities. May go out again tonight. A photo hike is scheduled for tomorrow. 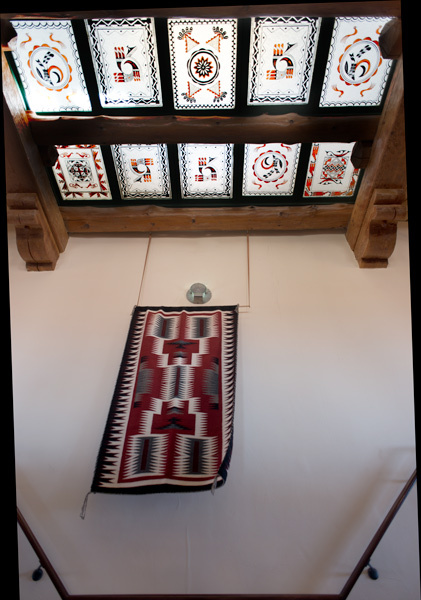 I am back in Moab, at the Sorrel River Ranch, a luxury destination, about 17 miles outside of Moab. 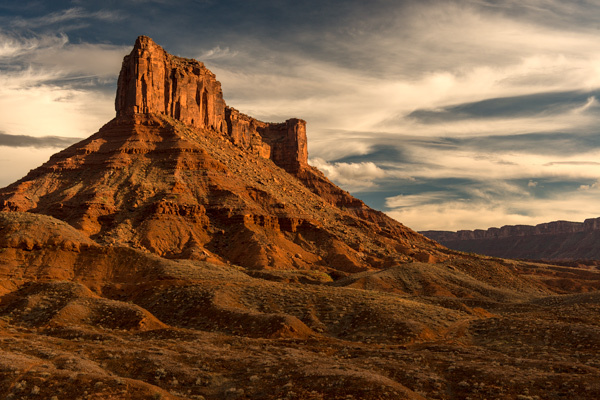 I will be teaching classes and accompanying tours to Arches and hikes to a local canyon (Fisher’s Tower) to talk about photography. A “Meet the Artist” session yesterday went fine; people seemed engaged. There was a small group of guests, but it seemed more intimate and friendly than the average gallery opening. 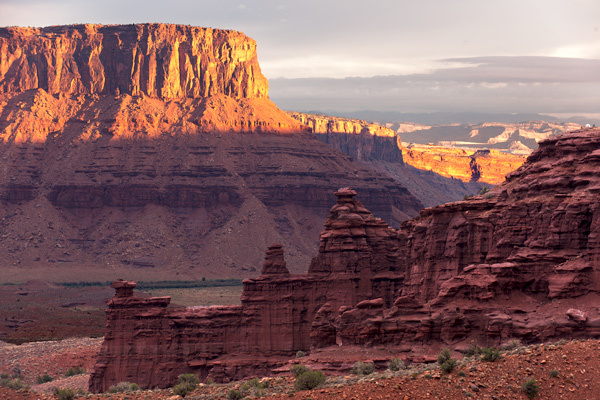 In addition to Arches National Park, the Ranch is right on the Colorado River, so there are about 17 miles of red rock cliffs and several recreational areas with camp sites in the area. I went to Fisher’s Tower this morning, and although it was overcast, I caught a break in the clouds just after sunrise. On Friday, there will be a photo hike to the same area. I hope that there is a good signup for the classes later in the week. This residency is an experiment for both myself and the Ranch and we will have to see how it goes as the week proceeds. I haven’t spent much time off the beaten path in the dessert with the exception of Blue Mesa and the Painted Desert below the Inn. Early and late are the key times, midday the light is uninteresting or unpleasant, being contrasty and glaring. Also I noticed that as the day goes on the air seems to get hazy, so looking out to bluffs toward the horizon doesn’t work. Did some wide angle images yesterday, getting right down on the ground to put big chunks of petrified wood against the formations. Some of them may have worked. In general I am finding that after about two weeks at these parks I have exhausted my immediate ideas, and hit the high points, and would either need much, much longer, or need to leave for a while and then come back in few months. 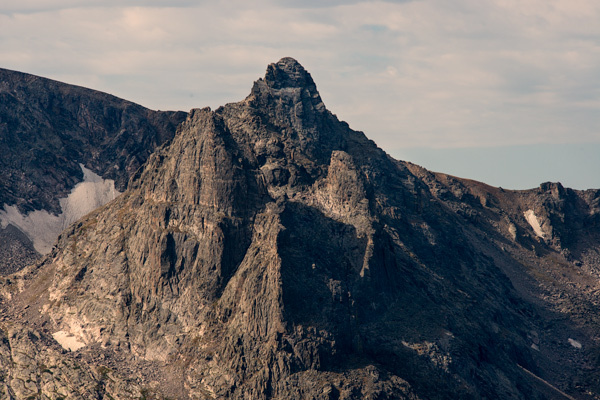 There are some physical limitations as well – I know there were opportunities on the higher peaks in the Rockies, but it was just beyond my capabilities – although I am slowly improving my physical condition. I would consider returning here in the future as this is actually a good season to be here. I caught part of the “monsoon” season and got some rain, rainbows, and a little of the dramatic skies, but there were only a few days with “interesting” weather. 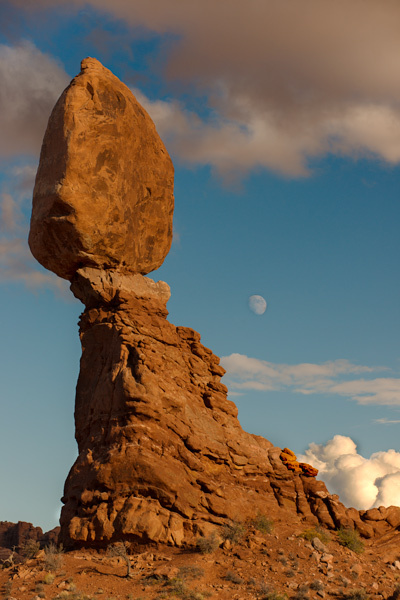 Although I am making an effort to post more consistently, I probably won’t post Sunday or Monday, but hope to have something new from Moab on Tuesday. Had a good time on the road last night with Andy and Margaret. We found a Hopi (Prairie) rattlesnake, several gopher snakes and a Chihuahuan night snake. Unfortunately several of the gopher snakes and the rattlesnake were mortally injured by cars and needed to be put down — very disappointing. We also found numerous small live Plains spadefoot toads and a Mexican spadefoot. We saw several squashed horned toads (which are actually lizards). Andy collected environmental data at the start, turnaround and end for this ongoing study. Various live traps and other studies supplement this information. We left at dusk and returned after a full circuit of the park road around 11 pm. 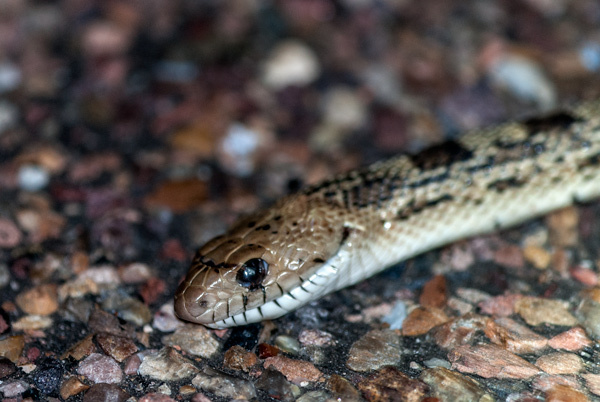 The gopher snake was the most commonly found snake last night. 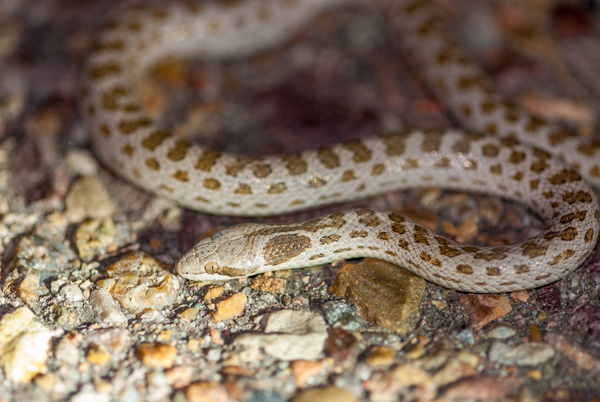 It looks similar to the night snake but can be readily distinguished because the nightsnake has spots behind the eyes. 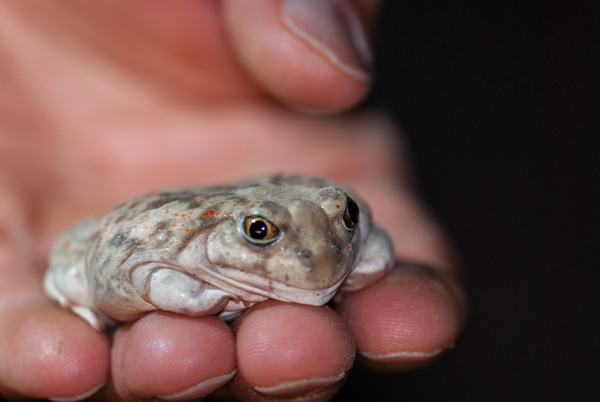 The spadefoot toads have spurs on their hind legs that they use to burrow backwards into the soil during the winter. They can puff themselves up to convince predators not to eat them. Altogether a very enjoyable and interesting night. My first and only required presentation for this park went OK, but only 4 people attended, one of whom was the other resident artist. The presentation was on my photographic influences, but I added a section on technology — stacked focus and diffusers — hoping it might be useful. Afterward, Matt took me and Anna Marie (the other resident artist) on a tour through “collections” of fossils and specimens. Matt is a paleontologist who curates the various fossils and artifacts and prepares various presentations and public materials. Really fascinating work; he was very generous with his time considering his workload. We also met Andy the wildlife biologist. I will be going out with him and someone else for a “road survey” tonight from 6 until they stop finding animals. Many desert animals are nocturnal and/or come out to warm themselves on the road. I haven’t seen much wildlife during the day, so I hope to capture some at night. Depending on how many animals they encounter, could be out until 1 AM…won’t be getting up for dawn light on Friday. Also found out that they have images of many of the local flowers, which will really help with identification. 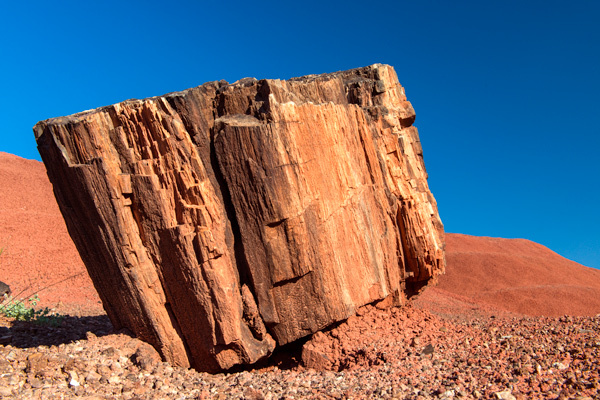 Increasingly I think I am tending toward simple graphic images of the red formations: black shadow, red crumbly rock, and bright blue sky. Somewhat reminiscent of Namibian dunes. I left home on August 8: What have I accomplished in the last 6 weeks? 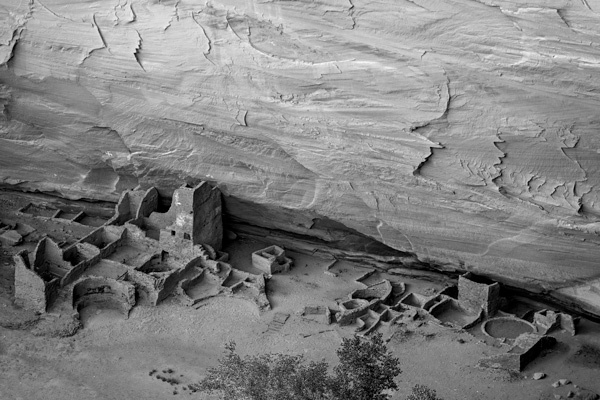 I have taken approximately 4500 photographs primarily distributed between the two parks with residencies and several nearby parks (Arches, Mesa Verde, Canyon de Chelly). 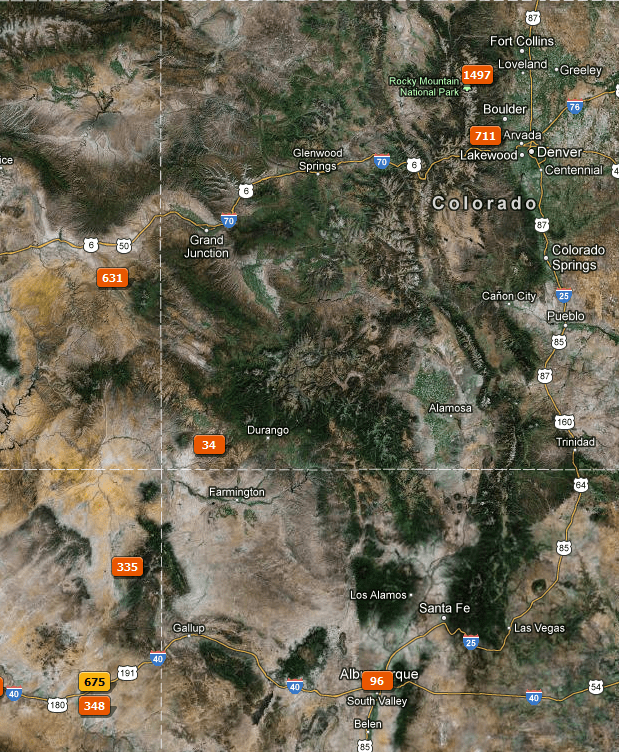 I have driven 4600 miles, spent $655 on gas and almost $3000 in total. 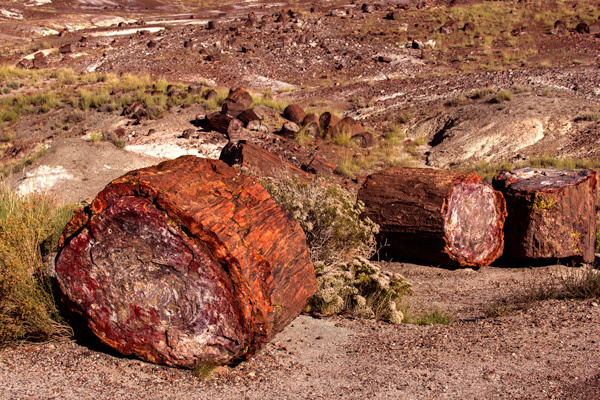 Geographically and culturally I have developed at least a superficial understanding for parts of Colorado and Arizona, and a slightly deeper feeling for two major national parks, particularly the smaller Petrified Forest. 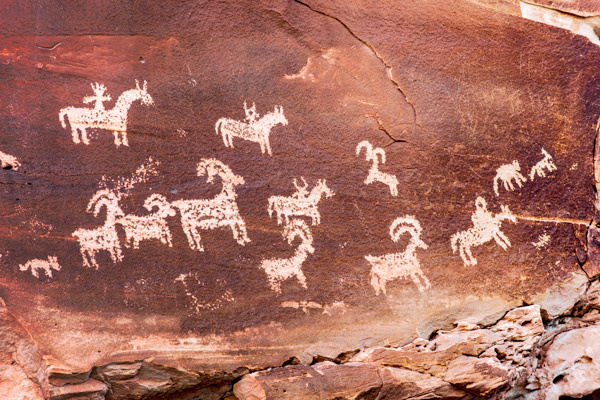 Looking at pictographs of the various southwestern Pueblo peoples I have felt some of the mystery, their generally peaceful way of life, and a little sensibility for their culture. A visit to the Georgia O’Keefe museum in Santa Fe was interesting and really points out that I should spend much more time studying art in general and not just photography. 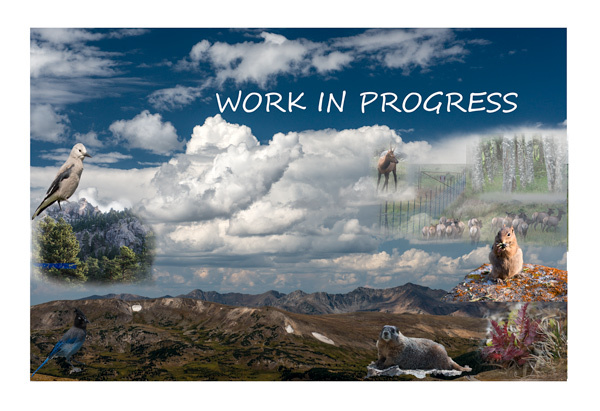 My Rocky Mountain project, to compare current scenes to archival photographs of the same scenes from the time of the Park’s dedication, found nothing major: basically the Park has been successful in preserving the environment and habitats, but was interesting to me personally. I will prepare a report for the Park on the project based on the powerpoint presentation I gave as part of my public interaction deliverable. Participation in the BioBlitz and some discussion with folks from iLCP was exciting, and Clay Bolt’s “Meet Your Neighbor” is a possible future direction for at least a part of my photography. Reviewing the RMNP images, I think that I have developed a reasonable body of work representative of the season, this particular year, and the more readily accessible areas. What is missing but was at least theoretically possible, is a much better survey of fauna and flora, and views from some of the higher individual peaks, although I did find the alpine/tundra areas impressive and photographed several times, I still feel it is superficial, but also limited by the season. I am preparing an “ecological composite” image for the Park, but I am not really satisfied with its artistic merits (comments on the work in progress below are welcome) and will probably offer the Park a choice of some individual images as the required submission for one piece of art. 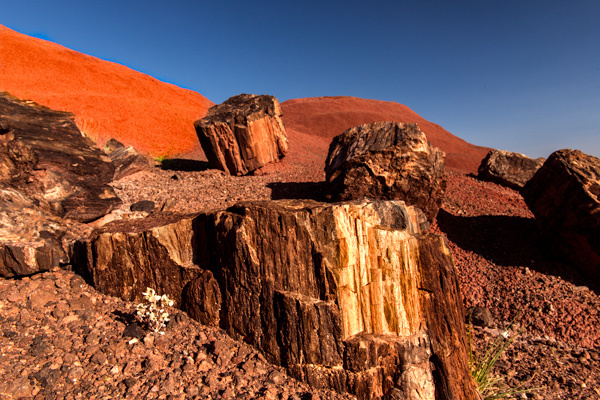 Colors and shapes dominate my photography at Petrified Forest. 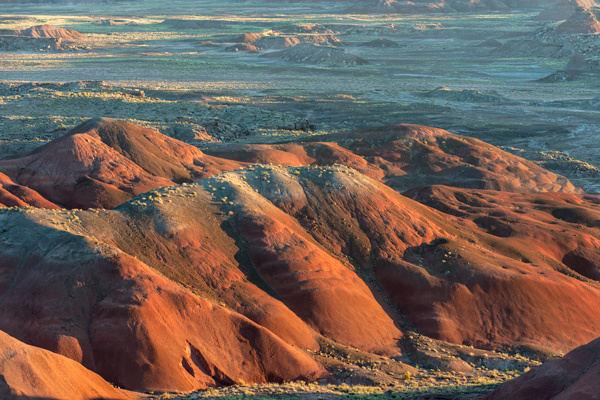 Yesterday evening in the Painted Desert, the contrast between the blue sky, red butte, and nearly black shadow was very striking. 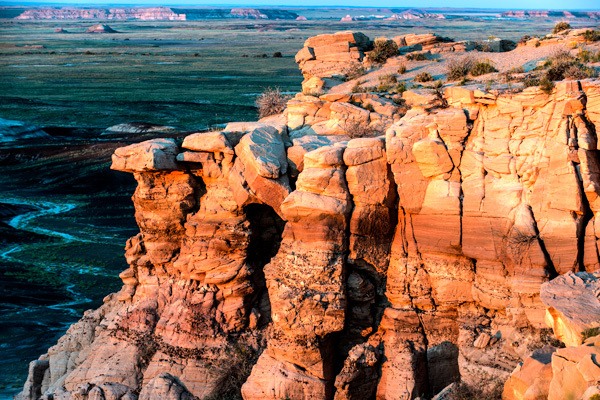 The layering of eroded cliffs at Blue Mesa and dawn across the desert are all valuable personal experiences. 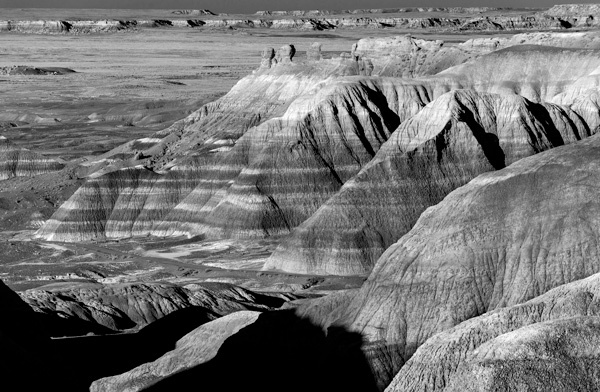 Perhaps the most urgent need is to evaluate what I need to add to the Petrified Forest work while I still have the chance. I would like to capture at least some wildlife. 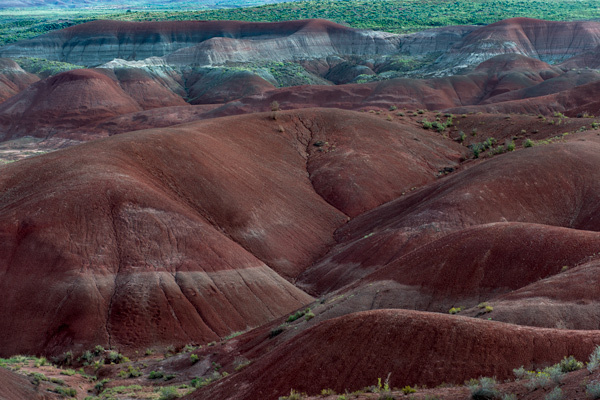 I think I also want to do more work from the desert floor, rather than looking down from the canyon rims. Professionally, I was in the right place at the right time to participate with a reporter and picture editor from a major eastern urban newspaper on an article on colors that might lead to some photo credits and a little cash. There may be an opportunity for a guest submission to an Albuquerque gallery and an article about my residency was published in the Estes Park Gazette. 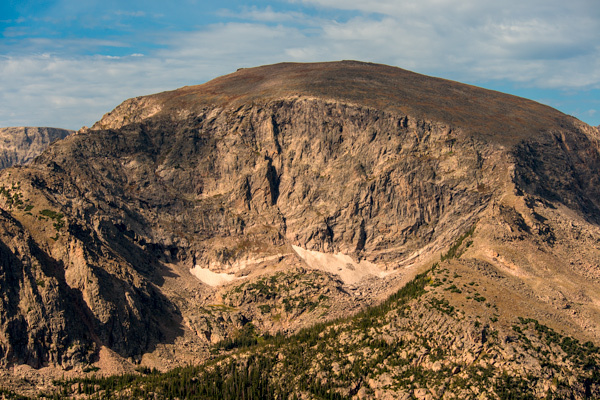 Adding additional residencies to my resume is a good thing (acceptance seems to range from less than 10% at RMNP up to at least 25%) as is adding extensively to the geographic extent of my portfolio. Over the next five days, I need to spend more time talking to Park Rangers and getting ideas on what I have missed. Comments on what I have done, what you would like to see, and your ideas are welcome. 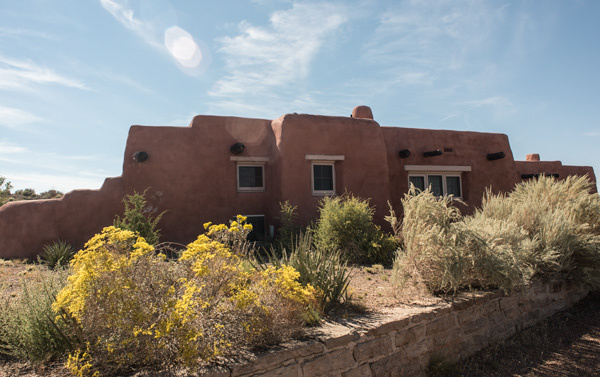 Yesterday I focused on housing: the Painted Desert Inn and the “cabin” where I am staying. The cabin is more than roomy enough for 1. There is a desk and a folding table in the bedroom/work room, and a small kitchen. There is a little utility room with drawers and cabinets, that I could use for clothes if so inclined (I tend to live out of suitcase and duffle). 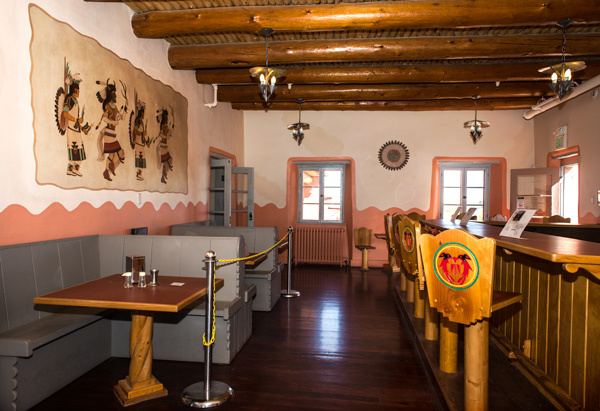 The Painted Desert Inn is right across the street and has a significant history associated with Route 66. Originally built on bentonite clay, the foundation was unstable and it was renovated several times and once papers were signed for it to be demolished, but it got a reprieve. 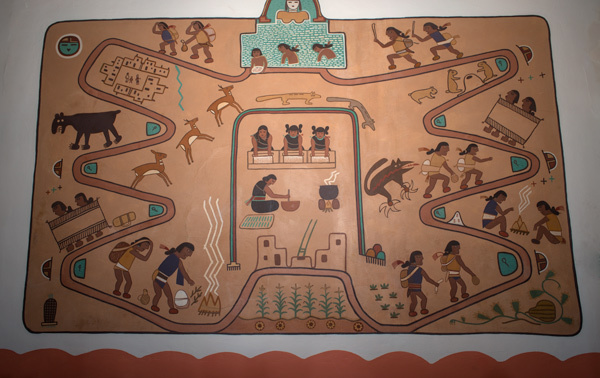 One of the more interesting aspects are the murals painted by Hopi artist Fred Kaboti. Lunch room and soda fountain. There were also slot machines at one time. I don’t know if it is the light, the structure or the adobe brick, but there is really something special about the remains of these ancient communities. Looking out from the Long House pueblo down a canyon that probably hasn’t changed substantially in 900 years, even with a crowd of people around, you could almost imagine yourself as part of that community, waking to the quiet of the canyon and thinking about getting adequate water or weeding your little patch of squash and beans. One thing I learned that I hadn’t anticipated was that at the back of the cave was a water seep, probably one of the reasons it was selected. Apparently, water seeps through the sandstone above the structure until it hits an impermeable layer of shale, which forced it out behind the buildings. 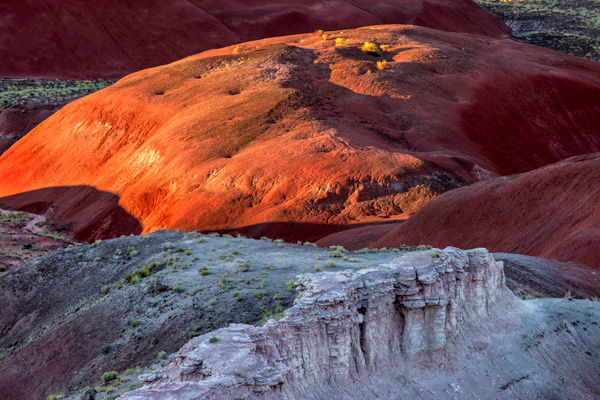 At Antelope Canyon, you can see round “kivas” which are believed to be ceremonial areas. In some canyons there were apparently communities as large as a thousand people. The actual rooms where people lived were actually quite small, even given that stature was generally smaller than modern day people. Although a few people may have lived to as old as 60 years, average life span was probably closer to 30. Breeding usually started young and mortality from childbirth was high. Also, they ground corn into flour between two stones (mano and metate) and their flour had a lot of sand in it, which ground down their teeth relatively quickly. 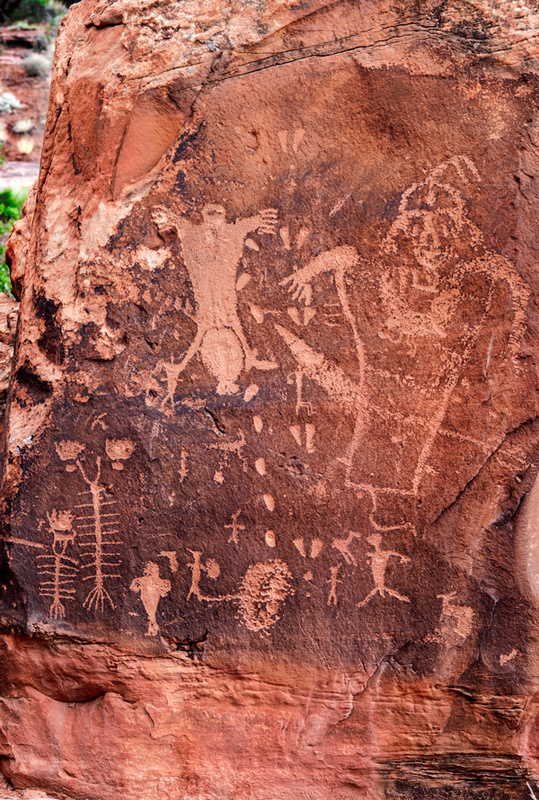 An important part of the Native American cultural record are petroglyphs scratched or pecked into rock faces. Most are on cliff faces, but this one was on a boulder sitting on the ground off of a dirt road in Kane Canyon. It shows a birth, which is apparently uncommon; animals and hunting more generally are depicted. 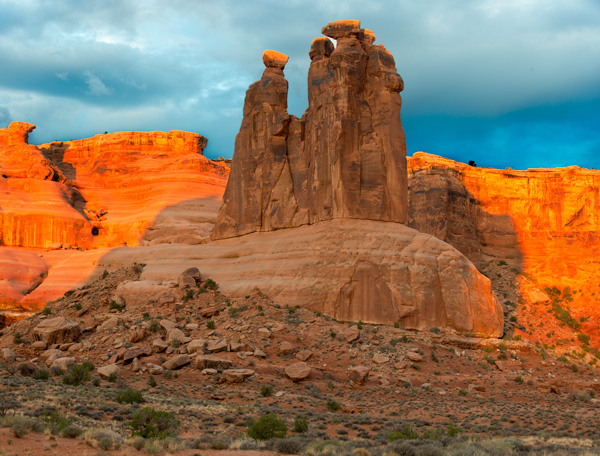 Like these from inside Arches National Park. The southwestern native American evolution of cultures is really fascinating and worth a visit if you should ever get a chance. From the mountains to the desert. Returned for a second time to the alpine area. At the top of the Tundra Trail going up from Rock Cut, it was like being on the top of the world. The tundra fell away in all directions, with huge puffy clouds seemingly just above your head. With the high altitude it was difficult slogging uphill. Forest Canyon overlook also had some really good views. Terra Tomah mountain bordered the canyon with Hayden spire, and an adjacent glacial cirque. The cirque was smaller, and I couldn’t get as good a picture, but here are the mountain and spire. From the mountains to the desert of Moab, Utah at Arches National Park. It is all about the light here. But the best light might last only five minutes. Delicate arch is to the left; this was taken from the high overlook. The gossips are lit in the morning, but here they were in shadow from another butte, while the surrounding area was lit with early sunlight. You can see where the light just catches the “head” of one of the gossips. 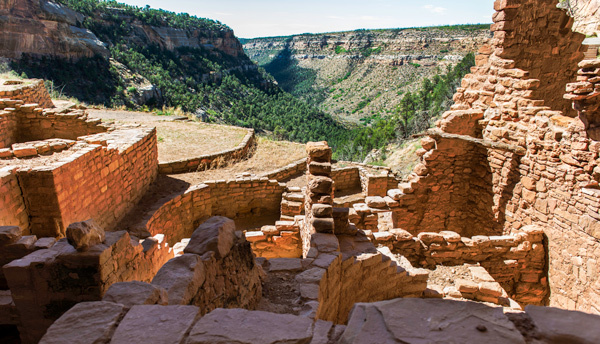 Heading to Mesa Verde tomorrow.